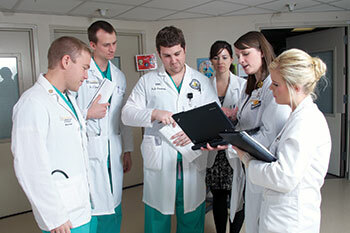 The UI unveils a new medical curriculum to prepare physicians-in-training for the challenges ahead. By 2020, the sheer vo lume of medical knowledge will double every 73 days. Already in the past ten years, new medical knowledge has doubled every 36 months. And, like a boulder barreling down a steep mountain, that speed only increases as one discovery drives the next breakthrough. Advances in human genome sequencing and personalized medicine, technologies like functional imaging and telemedicine, and the unfolding implications of healthcare reform all contribute to the staggering amount of information that doctors must absorb. At this rate—and in an environment more focused on prevention, responsive to patient involvement, and driven by increased pressure to provide quality care at low cost—how does a medical school prepare doctors for the challenges ahead? In such a complex, ever-evolving landscape, how can a patient walk into an exam room and feel confident in the hands of her Iowa-trained physician? In 2010, the UI Carver College of Medicine's 20/20 Vision: Curriculum Renewal Project directors began to answer these questions by brainstorming the attitudes, skills, and knowledge essential for medical practice in 2020. By the time they finished, they had designed a brand-new curriculum that distinguishes Iowa medical education as a model for the future. Patients and science remain at the heart of medicine, but now more than ever before, physicians practice on a sort of moving walkway. To adapt to the changing scenery of scientific breakthroughs and new understandings, the UI curriculum now features three educational strands that weave in triple-helix fashion across all four undergraduate years. Underpinned by a first-of-its-kind approach to basic science, the new curriculum provides medical students more up-front clinical experience; inter-professional opportunities to work with colleagues in dentistry, pharmacy, nursing, physical therapy, and public health; and designated time to pursue their personal passions and goals. The caliber of program caught Debra Schwinn's attention even before she became dean of the medical college two years ago. "I recognized the incredible transformation happening here, and it's been a privilege to help roll it out," says Schwinn. "Patients and science are the essential ingredients of medical education. [But] the accelerating rate of discovery clearly means that science can no longer be relegated solely to the first and second years of medical school (more or less), never to be revisited again. At the same time, relegating patient interaction to the last two years of medical school (more or less) is making less and less sense. "Our curriculum will produce outstanding physicians." When a person becomes ill, a dynamic interaction takes place between what's happening inside the body, the role environment plays, and the patient's relationship with the healthcare provider. The UI curriculum's overlapping strands mimic these interrelated aspects, preparing students to understand and embrace a more holistic view of medicine. The helix symbolizes the way students will return repeatedly to the same concepts with more depth and mastery—and an ability to carry that learning throughout their careers. Two of those strands in the helix—Medicine and Society (MAS) and Clinical and Professional Skills (CAPS)—launched last year. The final Mechanisms of Health and Disease (MOHD) strand becomes available this fall and is an approach to basic science found in no other U.S. medical school. As a graduate of Stanford University who went on to complete her residency at the University of Pennsylvania, Schwinn points out that most medical schools take a systems-based approach to basic science. Students learn separately about the cardiovascular, nervous, endocrine, respiratory, and reproductive systems. But Carver is the first American medical school to look at health and disease through an entirely different lens—one based on how the whole body functions. The UI medical curriculum now features three educational strands that weave in triple-helix fashion across all four undergraduate years—a first-of-its-kind approach to basic science. Disease doesn't affect just one organ system, Schwinn explains. A patient who comes to the doctor with chest pain doesn't necessarily have a heart problem. In fact, it could be esophageal, lung, or even rheumatoid arthritis pain—in addition to cardiovascular disease. So, UI students now focus on the six fundamental mechanisms of health: oxygenation; metabolism; genetics/development; immunology/inflammation; locomotion; and neuropsychiatry. Through a series of courses, each co-directed by a basic scientist and a clinician, they learn how these mechanisms function normally and can be disrupted by various diseases. Second-year medical student Nicole Peyton likes the way this approach integrates the basic undergraduate science classes she took—cell biology, biochemistry, medical genetics—into one umbrella course. Although Peyton only had access to MAS and CAPS last year, she's intrigued by what this new strand will offer. "Students will benefit from learning these together," she says. "They will be able to constantly add new material [to their understanding] instead of focusing on each class individually for each test." While MOHD focuses on internal factors in health and disease, Medicine and Society (MAS) covers the external forces that affect wellness. Environmental factors, people's lifestyle choices, and cultural and social influences lead to over half of human diseases, including heart and lung disease and cancer. With chronic conditions and an aging population on the rise, physicians must emphasize prevention and respond to the increasing personalized, predictive, and participatory nature of medicine. While the previous curriculum incorporated such ideas, the new coursework spends more time and emphasis on the critical environmental impact on health and disease. As such, the MAS strand stresses disease prevention, public and occupational health, epidemiology, and social determinants of health like poverty and insurance status. A diabetic patient who lives on minimum wage and has no coverage needs a doctor who understands life outside the exam room—because part of good medicine means applying context and compassion to diagnosis and treatment. "We're all within a state of flux between health and disease," says Christopher Cooper, 87BA, 91MD, 97R, the college's associate dean for student affairs and curriculum, a pediatrics and urology professor, and co-chair of the renewal steering committee. "We wanted our curriculum to focus not just on treating disease, but on the internal and external factors that lead us to health or sickness." The MAS strand also demands that students take their own self-care seriously. Students must complete a "wellness passport" by participating in activities that nurture their physical, social, and spiritual growth, whether by taking an exercise class, meditating, or buying vegetables from the farmer's market. Additionally, coursework stresses the humanities—an aspect Schwinn appreciates as a doctor who almost became a violinist. Firm in the belief that exposure to the arts cultivates a doctor's empathy, compassion, and wellroundedness, Iowa's medical program has a rich history in the humanities, including a 12-year-old Writing and Humanities program featuring courses like "The Examined Life: Writing and Medicine" and a separate track for students wishing to complete other creative work or research. Most of these offerings, however, are electives. Although previous required coursework featured humanities assignments, the MAS strand incorporates more mandatory reflective writing assignments to keep doctors in touch with their interior lives. "The burnout rate for doctors is pretty high," says Kristi Ferguson, internal medicine professor and director of the Office of Consultation and Research in Medical Education, who oversees the MAS strand. "We're trying to teach these habits of the heart early on so students can weather the storms of having a medical career." "Faculty just want to make sure that you are being a real person." Being a "real person" helps physicians identify with their patients. The Clinical and Professional Skills (CAPS) strand targets this central doctor-patient relationship, as well as how a patient's entire medical team contributes to quality care. People value a good bedside manner as much as a doctor's knowledge, so students practice patient interviews, taking vitals, and physical exam skills through the Early Clinical Experience (ECE). This new platform provides students clinical interactions right from the first week of medical school, placing classroom experiences in the context of patient care so that students gain real-world opportunities to reinforce what they're learning. UI students learn the six fundamental mechanisms of health: oxygenation; metabolism; genetics/development; immunology/inflammation; locomotion; and neuropsychiatry. Medical students commit to the long road after a bachelor's degree—including "undergraduate" medical school, residency, and beyond—because they want to make people better. That's where their passion lies. So they appreciate the curriculum's commitment to clinical exposure at the outset. "We all come to medical school to help patients, and the best way to learn is to interact with them," says Peyton. Whereas before students largely had to wait until the third year in medical school for such interaction, all three strands of the UI's new curriculum allow them to immediately apply their studies in a clinical setting. In their first year, in fact, students are paired with a physician-mentor to shadow. This partnership continues throughout medical school, a supportive relationship that Evans believes will "make a big difference" at every stage. But perhaps what most sets the CAPS strand apart is its interdisciplinary nature. CAPS brings together students and faculty from all seven UI health-sciences programs to work on simulated patient scenarios, exchange ideas, form solutions, and deliver treatment in a team environment. 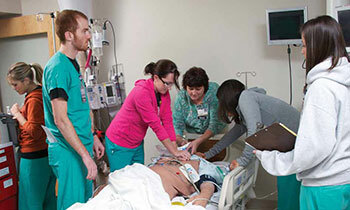 In small groups, a medical, nursing, physician assistant, pharmacy, public health, dentistry, and physical therapy student gather for instructional activities followed by hands-on practice—including the opportunity to share and interpret each other's contributions via a version of the UI Hospitals and Clinics' electronic medical record. In one scenario last year, a fictional patient needed assessment following an emergency dental visit to drain an abscess. After a dentistry student pointed out that smoking is a top risk factor for periodontitis, the group suggested smoking cessation treatment. Peyton enjoyed small groups like this because everyone was able to receive important feedback from classmates. "I value my peers' opinions," she says, "and I was able to use their knowledge to develop my own skills." 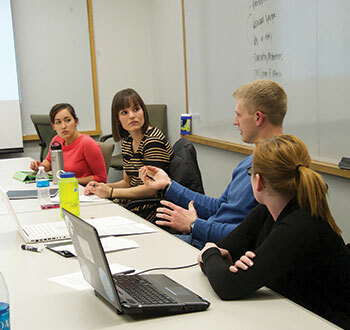 CAPS brings together students and faculty from all seven UI health-sciences programs. Such collaboration—a patient's bona fide dream team—represents the future of healthcare delivery, a mutual effort to obtain, share, and process information that no one person can or should handle alone. Says Schwinn: "Medical students must understand the richness of what someone else brings to the situation. We can't educate people in silos and ask them to work in teams." CAPS courses also stress the fact that even after students become doctors, in a way they must remain students. In order to stay relevant and up-to-date with fast-changing knowledge, physicians must cultivate habits of self-directed lifelong learning. Patient experience deepens later when students reach the required clerkship level of their training, when they rotate through every aspect of the hospital—from OB/GYN and pediatrics to neurology and radiology—and often finally discover what aspect of medicine they wish to practice. Under the new curriculum, this time for professional exploration starts earlier (after just three semesters as opposed to four), leaving students the last 18 months of their undergraduate education to complete a capstone track called Pathways. This component offers a selection of additional electives, research, and other areas that will enhance and further individualize their chosen career specialties. The previous curriculum permitted some flexibility for students to pursue added interests. Last year, third-year student Cristina Woodhouse was able to take a year off from medical training to complete a master's of public health degree. The Honduras-born Woodhouse, moved by the plight of the people there, plans to merge her degrees to address the myriad health problems in this developing Central American nation. Following graduation, she plans to practice in the U.S. with an emphasis on prevention and health policy, but her eventual goal is to establish a public health center in El Porvenir, Honduras, that will promote and support healthy lifestyles through education, access to healthier food, a place to exercise, social support, and knowledgeable community health workers. To raise awareness and garner support for her project, she's already established the "Shake the World" fundraising initiative for El Porvenir, even as she finishes the hard work of earning her medical degree. "After my first visit to Honduras, I realized global health had to be part of my career, and I wouldn't be happy as a physician otherwise," says Woodhouse, who was adopted by an Iowa City couple as a young child. "I realized not all children there would be as fortunate as I was. I had to find a way to give something back—because I have been given so much." With a new curriculum that provides students even more opportunities to follow their passions, the UI Carver College of Medicine will continue to produce such distinguished graduates. Blending intelligence, adaptability, and heart, they represent the type of doctor Thomas Edison predicted more than 100 years ago: physicians who "will interest patients in the care of the human frame, diet, and in the cause and prevention of disease." It seems the doctor of the future has arrived.